Quiet five fans provide superior airflow at whisper noise levels,it allowing you to work all day without making any noise and interrupting your flow,provide a noise-free environment for you. This laptop cooling pad is conveniently powered by the USB port on your computer,with no power adapter needed. It offers an additional USB port for you to connect other devices. The laptop cooling fan has an ergonomic design that's thin and lightweight for easy portability,7 levels adjustable design to lift and tilt your notebook display and keyboard for increased comfort.Give your laptop and yourself a better gaming/working environment. The bottom of the stand is equipped with a USB cable storage slot,to prevent the USB cable from being forgot and lost. Our products have a 12-month warranty.If you have problems with product when you receive our product or during use,please contact us,we are pleased to offer you better service.Customer satisfaction is the most important for us. Compatible with all laptops 12'' to 17.3"
Nobebird laptop cooler covers 12-15.6 inch laptop ,compatible with 17'', 17.3'' or larger notebook,and the extremely sturdy polished metal mesh provides a stable surface for you to enjoy working on the computer. 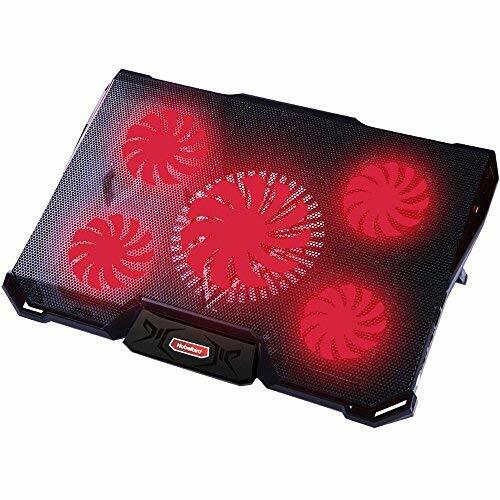 【Super Powerful and Quiet Cooling】Features five ultra-quiet fans provide optimal air flow,4 fans at 2200 RPM + 1 fan at 1100 RPM,in addition to deep cooling for your computer and create a safe and noise-free environment,with eye-catching red LED lights which helps to confirm the laptop cooler is running. 【Extra USB Ports】2 USB ports design,one is used for connecting laptop or power band to drive the cooler.The another USB 2.0 ports for data transmission or connecting other devices. 【Dual Switch&Non-Slip Baffle Design】2 switches on the right side, you can adjust the wind speed,one of the switches controls 3 fans and the other switch controls 2 fans.Build with Non-Slip Baffle,you can insert baffle into the cooling pad front of the groove,effectively prevent laptop slipping off,suitable for any thickness of the notebook. 【7 Height Adjustment】Support 7 levels of height and angle adjustment, lift and tilt your notebook display and keyboard, ergonomic comfort, according to your degree of comfort and desk height,choose to adjust to different heights, in order to reduce the use of computer neck Ministry and back pain. 【Compatibility】Full range metal mesh optimizes the air flow to rapidly dissipate enormous heat generated in the laptop, Nobebird laptop cooler cover a 12-15.6-inch notebook, for laptops of 17, 17.3 or larger, your notebook will exceed the width of the cooler, but the notebook cooler works on the laptop's motherboard and CPU, the cooler will completely cover the entire area that needs to be cooled, quickly cooling your notebook, without affect stability and heat dissipation. (USB cable included).